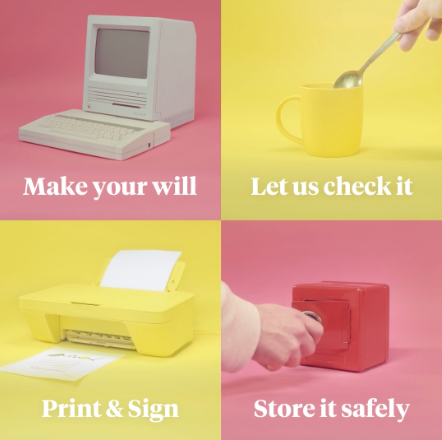 The post explains how to choose a guardian in your will, and how to get yours sorted, with zero fuss, today. Why do you need to appoint a guardian in your will? By the age of 16, around 1 in 20 children will have experienced the death of one or both of their parents. Without a guardian appointed in your will, you don’t get a say in who would take care of your child. Lots of people think that custody of their children automatically goes to your partner or next of kin, like a mother or sister. Unfortunately, this isn’t how it works. Making a will is the only legally binding way to decide who you’d like your child’s guardian to be. Is my partner automatically the guardian? Guardians are ONLY called into action if there are no surviving parents - meaning people with parental responsibility. If your partner does have parental responsibility over your child, they will automatically take care of them. Mothers always have parental responsibility. Fathers have responsibility if they were married to the mother at the time of child’s birth or named on the birth certificate. Find out more about who has parental responsibility. How do you choose your guardians? Common choices tend to be close family members or friends. If you have parents who are young and healthy enough to look after your children, they often make a great choice. Similarly, if you have siblings, they can be a good choice too, especially if they have young children as well. Values — are there any cultural or religious values you’d like your children to be raised with? Does your nominated guardian share these values? How many guardians should you choose? It’s advisable to choose one guardian to look after your children, or two if they’re a couple. What do you do once you’ve chosen your guardian? Once you’ve chosen a guardian, it’s a good idea to talk it through with them and let them know your wishes and that you’d like to name them in your will. If they’re happy with being asked (in most cases people are incredibly flattered) then simply add them to your will and you’re done. What if it’s too hard to make the decision? 1 in 30 parents die before their child in 18. And 1 in 5,000 parents die at the same time. So while it’s not the most pleasant thing to think about, it’s important to take action and make your decision. When you make your will online, you always have the flexibility to go back in and change your nominated guardian at any time. So don’t keep putting it off. If you have a child under 18, appointing a guardian in your will is an essential part of planning for the future. Farewill is an online will maker that gets the job done easily in 15 minutes.